Have you ever had the experience of looking forward to visiting a place you have heard so many good things about, and then having your visit exceed your expectations? Well I have just gone through such a feeling when I paid a visit to Old Friends Thoroughbred Retirement farm just outside Georgetown, Kentucky. The farm is a must see attraction in the Lexington area. 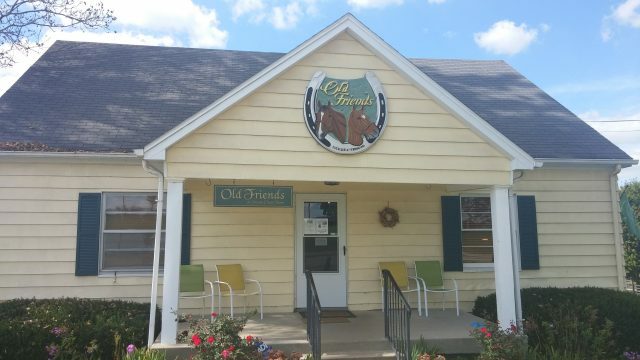 Founded by horse lover and farm president Michael Blowen, Old Friends is a haven for retired thoroughbred horses that give these wonderful athletes a place to live in dignity and just be a horse. There is a wonderful air of tranquil calm and peaceful happiness that waft through paddock after paddock. 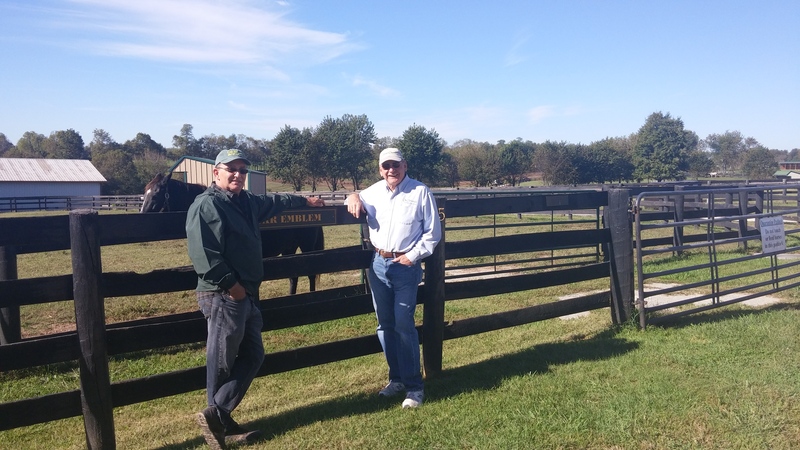 Farm staff and volunteers are constantly smiling and thoroughly enjoying their duties and contributions they make to keep the horses happy and content. That is a reflection of the genuine love of the animals emanating from Michael. Michael Blowen was in the past an accomplished movie critic and met and interviewed many well known and beloved stars of the screen. He was never star struck, unless you mention a champion race horse. His admiration for the courage and determination of a horse in trying to win a race captivated him beyond what any actor or actress did on the screen. It is from this admiration and respect he feels that inspired Michael to found Old Friends in 2003, and turn it into a place to honour past champions, popular stakes winners, and beloved horses that may not have been as accomplished on the track, but earned the love of those they competed for. Old Friends is funded through the generosity of many long time horse people. The residents are re-located to the farm by some of the leading movers and shakers in the racing world. Fund raising is also a key contributor to the operation of the farm. Since there are many older former stallions, mares and gelded ex race horses populating the farm, many of them will have developed infirmities. Previous owners and local equine hospitals donate services and capital to see such horses receive the veterinary care they need. One such recent case is the 1996 Breeder’s Cup Classic winner Alphabet Soup. After his successful career on the track, Soupy became a popular stallion for Frank Stronach’s Adena Springs farm just outside Paris, Kentucky. Alphabet Soup was retired from stallion duties and Stronach donated the lovely grey to Old Friends. Michael was thrilled to have him become a permanent member. However, Alphabet Soup developed tumors that needed immediate attention. Stronach paid for the veterinary work, even though Soupy was no longer a money earning stallion, and the horse has recovered. Soupy is a very un-stallion like soul, gentile and very people friendly. He is a very popular horse which visitors and staff enjoy spending time with, and Alphabet Soup returns the adulation in spades with his human friends. One of the star attractions at Old Friends is another poplar grey, Eclipse Award champion Silver Charm. Returned to Kentucky after his stallion career ended in Japan, Silver Charm was one of Michael Blowen’s all-time favourite race horses. To say he was thrilled to have Silver Charm retire to Old Friends would be an understatement. Silver Charm’s arrival created a media buzz and the horse has been visited by his close friends during his Hall of Fame Career. Jockey Gary Stevens and trainer Bob Baffert have on numerous occasions come to see the star they had played a big hand in helping. 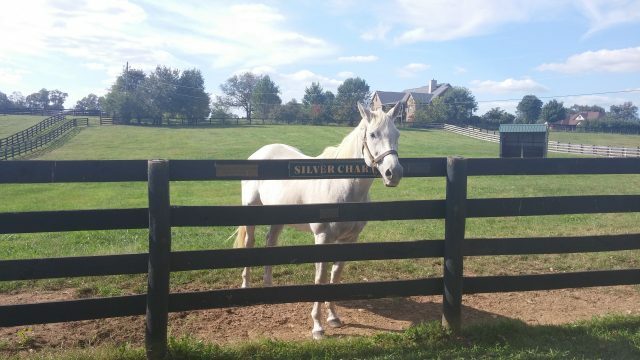 Michael told me “One morning I was in the house having breakfast, when I looked out the window to see Silver Charm. His paddock is right there so I can see him first thing each day. Well when I looked out on him this morning, Bob was there having a nice quiet visit with his old champ. Now you can’t tell me that these guys don’t have their favourites”. Silver Charm draws in the fans as well. Since his arrival at Old Friends, visitor attendance is on pace to reach a record level for the year. Silver Charm is enjoying his fame like never before. He gets plenty of love, and carrots, from fans and especially from his biggest fan Michael. Silver Charm is appropriately named because of his coat colour and his very charming and social personality. One feels as if they are the presence of equine royalty when around Silver Charm. In a paddock within eyesight of Silver Charm resides Touch Gold. Now you have to know that these two have a history. Silver Charm had won the both Kentucky Derby and the Preakness Stakes and was going for the elusive Triple Crown in the Belmont Stakes. They had faced each other in the Preakness, but Touch Gold had fallen to his knees at the start and had too much to overcome finishing fourth in the race, but only one and a half lengths behind Silver Charm. Touch Gold denied Silver Charm the Triple Crown when he came from behind and beat the popular grey by three quarters of a length. There are many Silver Charm supporters who never forgave Touch Gold. Not Michael Blowen however. He appreciated Touch Gold’s determination and talent, even though his favourite had been beaten. He was thrilled to receive Touch Gold when Frank Stronach donated him. Touch Gold comes from a very distinguished family that includes two Canadian Triple Crown winners, his half brother With Approval and his cousin Izvestia. He went on to win the prestigious Haskell Stakes and then a moderately successful stallion career at Adena Springs. Touch Gold however was not a very people friendly guy. He came to Old Friends with a warning tag from his handlers. Now here is where the serenity of Old Friends has helped in calming a horse known to be tough to handle. Touch Gold has mellowed considerably since he took up residence at Michael Blowen’s haven for horses. I personally remember Touch Gold and witnessed on several occasions his antics in the paddock at Woodbine. During his racing and stallion careers he could be a handful for even the most experienced handler. When I visited him, I was feeding him carrots and petting his neck. Oh he can still be testy, but not near as severe as he once was. And he sure is an attractive animal. Another similar personality on the farm is War Emblem. He is, I might add, a very intelligent horse. War Emblem was trained by Bob Baffert who once told Michael “War Emblem was perhaps the toughest horse I ever trained. He once tried to kill me. It was so well planned. I think he had been planning how to get me for a couple of weeks”. However War Emblem was one of the more popular Kentucky Derby/Preakness winners in recent times with race fans. His bid for the Triple Crown came up short in the Belmont, which was won by another Old Friends resident Sarava. War Emblem has an “I do it my way or not at all” kind of outlook on life. Case in point. He was to become a stallion in Japan at Shadai Stallion station but he decided that he there were only certain mares he would attend to. War Emblem refused to cover most of the mares booked to him, frustrating his handlers and of course the Yoshida family who invested huge sums of money. As the years progressed, he became more and more fussy as to which mare he considered as worthy of his attention. He could be stubborn and when pushed, very aggressive. War Emblem did not have the greatest of fertility either and got only a few of the few mares he covered pregnant. The Yoshida family eventually threw in the towel two years ago and War Emblem was retired from stud service, not that horse really cared mind you. The Yoshida’s donated War Emblem to Old Friends. They say that when a horse knows he is a star, they will let you know every time about it. War Emblem is the epitome of such a star. He can still be tricky and you have to be careful with him. As with Touch Gold, War Emblem is mellowing. The calming effect of Old Friends can soothe the savage beast. However there is a second fence line between War Emblem and the fans, just in case he decides to be frisky. So no one but a select few are allowed to approach him. As stated, War Emblem’s arch nemesis Sarava is also on the grounds, but in this case a good distance away. Sarava has a personality that can be described as quirky. As the tour group approached his paddock, he came over and socialized for a while, then abruptly turned away and went back to his grazing. The group began to move on and Sarava noticed this and followed along the fence. It was almost as if he was saying “Hey where ya’ll going? I won the Belmont over that nutbar up there so come back and see me”. One of the richest, in terms of money earning race horses, on the farm is Game On Dude. The “Dude” is the kindest and most social horse one can ever meet. Everyone who has met him falls in love with him. The group took turns petting him and offering a steady diet of carrots. However, his paddock mate Little Mike became jealous and sought the attention and carrot hunted by pushing Dude away. Game On Dude while a determined competitor on the track, is so gentle he just bided his time and got a good supply of treats from the youngest member of the group Kaitlyn and her parents. The tour guide we had was a very entertaining man named Charlie Brown. Yes that is his real name. He could regale the group with little antidotes of each horse on the tour and of course keep people back from the testy ones. Once he discovered that I am a writer and have some knowledge of the horses, he would tease me and say “Is that right Colin?” always with a grin. When he said something that I didn’t know, which was often, he would say “Ha, gotcha!” Such is the easy going and friendly atmosphere of Old Friends that visitor are entertained, and the horses are at ease. While at this time of writing there are one hundred and three equines in residence at Old Friends, and I have touched upon only a few, I would be remiss if I did not mention two more that have a unique significance. The first is a special soul who never raced. His mother however was very famous, she being the great Kentucky Derby winning filly Genuine Risk. She had been an exceptional racer, but had difficulty as a broodmare. Genuine Risk had trouble carrying a foal to term, but finally did so when she was sixteen. Her colt by Rahy was a lovely chestnut, just like mom and was given the apropos name Genuine Reward. Unfortunately Genuine Reward did not have his mother’s talent and was subsequently sent to Wyoming for stud duties. He sired only forty-seven foals and also did duty as a sire of Polo Ponies. He was offered for sale on Craigslist for a paltry $500. Among the people who noticed his listing was author Laura Hillenbrand and Genuine Reward eventually came to Old Friends. His place in history, while unique, is secured as the first of two foals his famous mother was able to produce. 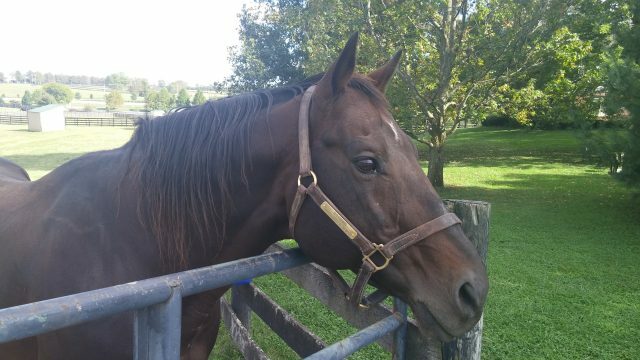 He is another of the gentile retirees that grace the farm and he gets plenty of attention from visitors. The other resident I want to mention is more personal. Being Canadian and having been a long time fan, I have developed an interest in many local horses. One of which was a dark bay gelding named Victor Cooley. Victor Cooley won our biggest race, the Queen’s Plate in 1996 and a pair of other stakes races to be named the Sovereign Award champion three year old. He also finished second in the grade one Molson Export Million to Skip Away. The next year Victor Cooley won the grade one Vosburgh Stakes. He was no slouch on the track, and I followed his career with interest. I knew his sire very well, an unremarkable allowance winning stakes placed son of Tentam named Cool Victor. Victor Cooley’s dad was a black horse that was owned by prominent Canadian breeder/owner Steve Stavro, who kept his breeding stock at Windfields Farm in Oshawa. Cool Victor was used as the farm teaser stallion, and bred to one or two of Stavro’s mares as a thank you for his work. Well wouldn’t you know it but Cool Victor’s very limited offspring had talent. He sired only seventy foals, but fourteen of them became stakes winners and two, Victor Cooley and Apelia became champions. So for me to see Victor Cooley alive and well at Old Friends brought the meaning of the farm’s name close to home. Victor Cooley was not on the tour. When the tour concluded, Charlie asked me if I would like to meet Michael Blowen because he felt the two of us would get along well. Charlie was so right. Michael asked me if I would like to come with him and see more of the farm and the horses. I was thrilled and honoured. That was when he took me to see Victor Cooley and many more notable horses. Time was getting late and Michael and I were enjoying the stories we swapped with each other so he asked me if I could return the following morning and we could get together and drive around some more. We spent a few more hours together and I got to know more of the horses and of course Michael and his staff, including John the retired police officer, tour guide Jane and many more. Their genuine enthusiasm and admiration for Michael’s work and vision of the farm has given them retirement jobs that they thoroughly enjoy. Having met Michael Blowen and spending time with him, I feel as if I have met someone who sees a horse in the same way as I do. He genuinely loves these animals and he wears his passion on his sleeve. It is refreshing to spend time with someone with the same enthusiasm as I have. Watching Michael care for every horse, no matter their track accomplishments, and seeing how well he knows each and every one of them renews my faith in the human spirit. I am proud to have met such a man, and I also proud to call him a friend. Before this article comes to a close, I want to mention the real star of the farm. He isn’t human, nor is he a thoroughbred. He is a miniature horse named Little Silver Charm. This special horse has written a book, has a large following on Facebook, roamed the fields with the big boys, and walked in on Angie Dickenson when she was staying with the Blowens. He is a character and a half. His miniature paddock is right across from big Silver Charm. Little Silver Charm gently taps on the metal gate to his paddock to get visitors attention and visit his ever growing legion of admirers. His social nature endears him to all. Old Friends Thoroughbred Retirement is heaven on earth. One can spend their money and see many of the magnificent breeding farms all around Lexington, and have a thoroughly enjoyable experience. However, if you looking to experience something that is poignant, memorable and very moving, book a tour with Old Friends and take the family. A ten dollar donation helps towards raising the funds to keep this wonderful nonprofit farm in operation. Shop in the gift store where all sorts of hats, shirts, books and pictures are available. The proceeds are to provide not only a well cared for facility for the horses, but to also provide the funds to expand and offer homes to more horses in the future that deserve to be treated with the love and dignity they truly deserve. If a horse could speak, every one of them that have lived at Old Friends would call Michael a saint.